This October, we’re challenging ourselves to watch at least one horror movie a day. Today’s pick is David Cronenberg’s final and arguably best true body horror movie. Discussions of David Cronenberg’s filmography often cite his Kubrickian chilliness as a filmmaker. His films feature gloriously gruesome body horror or icy idea exchanges, but all of his films have a certain emotional detachment. We ponder Cronenberg’s films, but we don’t really feel anything. I don’t find this argument entirely fair, because it disregards the heartbreaking emotional throughline of his The Fly remake (and The Dead Zone, but that’s another article). Philosophical exchanges of ideas and hopes of scientific achievement? Check. But there is nothing emotionally detached about The Fly’s world. Its surface-level narrative may be about a man transforming into a giant insect/ human hybrid, but its subtext involves an individual succumbing to an illness while those around him can only watch in horror. I don’t know if the film’s plot really needs to be discussed. It’s The Fly. If you haven’t seen it, you’ve probably seen it parodied. But, ostensibly, it’s the story of scientist Seth Brundle (Jeff Goldblum, in a career-best performance) who creates a teleportation device. While showing it off to reporter Veronica Quaife (Goldblum’s then-wife, Geena Davis), the two start to fall for one another. One night, after she abruptly leaves his apartment to see her editor, Seth decides to try his device on himself. He fails to realize a fly has accompanied him and emerges genetically fused with the titular fly, and that he’s a dead man from the moment he leaves his device. Many of Cronenberg’s films feel detached because of their protagonists. It’s difficult to emotionally care about James Woods in Videodrome, Viggo Mortensen in A History of Violence, or either Jeremy Irons portrayal in Dead Ringers. The Fly’s likable, endearingly geeky Seth Brundle doesn’t fit that mold. We like him instantly, and his blossoming relationship with Veronica gives the film an emotional core that makes the approaching horror land even harder. We actually care about what happens to these characters, and we’re emotionally attached to their sweet-natured romance. Davis and Goldblum have a natural, playful chemistry together that makes them believable as a couple. Watching their romantic hopes fade and die feel like the ultimate tragedy. The film takes its time with Seth’s and Veronica’s relationship, which means when we watch him step into his teleportation device, and we see that infamous fly wing its way inside, our anxiety and angst increase, because we don’t want to see this happen to such an affable character. Once he emerges, it’s simply a waiting game as Brundle’s humanity slowly falls away, overtaken by a primitive lifeforms’s baser instincts. 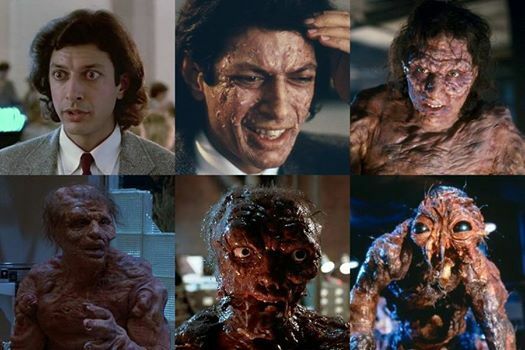 Goldblum wasn’t exactly a leading man when was cast, nor was he the well-known, eccentric supporting actor he is now, but he brings a believable quirkiness to Seth ’s personality and beautifully projects the emotional and psychological anguish that accompanies watching himself transform into the Brundle-Fly. Chris Wallace creates stunning visual effects, and they’ve aged well over the more than thirty years since the film’s 1986 release. They’re gooey and tactile, which lends a believability to them that CGI effects can never quite muster. They convey the painful, gruesome horror of Brundle’s metamorphosis. Every body part that detaches or emerging deformity looks painfully horrific. We share Veronica’s heartbreak as she watches Seth falter and decay because both she and we are unable to help. Both The Dead Zone and The Fly signaled a new phase in Cronenberg’s career, as he merged his body horror fascination with a more mature, emotionally rewarding narrative. He’d eventually leave much of his horror roots behind for more mature fare, but his earlier iciness feels even more prominent in his later work. The Fly remains his most emotionally nuanced and technically accomplished film because it embraces ideas and sentiment. Tomorrow’s Pick: Return of the Living Dead. Great article. Better than the original film as well. What are your thoughts on the sequel? I saw it not that long ago. It quite a good sequel actually. Not as good at the first and still goes for shocking gore but not as passionate as the first one. A bit more american than first one. Not quite sure why they cast Eric Schulz. Give it another try. I liked the sequel but it is not as good. It feels more like a standard slasher flick but where the protagonist is the murderer. Some of those scientists were just scientists doing their job. Bartok’s fate was a bit too much.